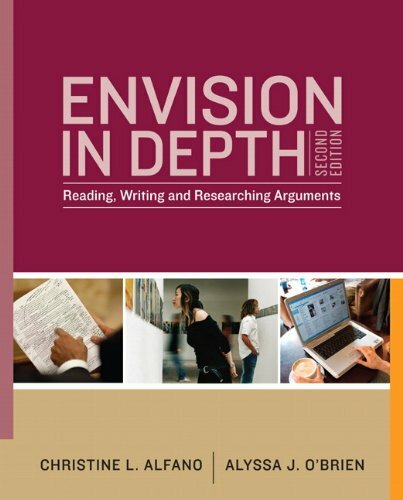 Envision in Depth: Reading, Writing, and Researching Arguments 2/e, is a combined rhetoric and reader intended for composition courses focusing on argumentation and research-based writing. Taking contemporary culture as its central theme and context, Envision in Depth is concerned with the fundamentals of analyzing and writing powerful, effective arguments. Students using Envision in Depth will learn how to analyze and compose arguments, design and conduct research projects, and produce persuasive visual and oral presentations in response to over 100 contemporary arguments in a wide range of verbal and visual genres. If you have any questions about this product by Longman, contact us by completing and submitting the form below. If you are looking for a specif part number, please include it with your message.